If you’re looking for an outdoor camera that’s smart enough and yet sturdy enough to brush off bad elements, then the Nest Cam Outdoor IQ is the right outdoor security camera for you and your family. Nest Cam Outdoor IQ is smart enough to tell the difference between a person and a thing. Nest Cam Outdoor IQ is a state-of-the-art outdoor security camera that has an incredible sight. Its camera is capable of spotting a person 50 feet away. Within this distance, this outdoor security camera can determine whether what it spotted is a person or a thing. Once it determines that what it spotted is a person, it then sends a notification alert – a photo of who’s there – via Nest app installed in your smartphone or tablet. This camera is equipped with a 4K digital sensor, HDR and 1080p HD video and can be zoomed in up to 12 times for an enhanced view. Once this camera detects a person, it automatically zooms in and follows the person. The camera will show you a close-up tracking shot with a wide 130° view. Nest Cam Outdoor IQ is smart enough to tell the difference between a stranger and a familiar face. If you subscribe to Nest Aware, in addition to receiving a photo of who’s there, you’ll also be informed whether this person is an unknown person or a family member. Nest Cam Outdoor IQ is smart enough to identify a person talking or a dog barking. Nest Cam Outdoor IQ is equipped with a speaker, a three-microphone system, noise suppression and echo cancellation. This outdoor security camera sends you an alert via your smartphone or tablet if it hears (even if it doesn’t see it) a person talking or a dog barking. So, you’ll be alerted via your dog’s bark when someone is lurking near your home or simply inform you that your dog is harassing the neighbors with its non-stop barking. With the camera’s built-in speaker, you can also hush – via the speaker – your dog from further barking or tell the intruder in your home to get off your property or threaten the intruder that you’re reporting the incident to the police. Nest Cam Outdoor IQ won’t let you miss a thing. If you subscribe to Nest Aware, you won’t miss a thing with what’s happening outside your door as Nest Aware continuously records what’s happening, 24/7 for up to 30 days, allowing you to review the entire 30-day video history, not just clips. If after scanning the video, you’ve noticed that your dog was making some funny antics, you can share the video clips with family and friends. If an intruder tried or entered your home, you can share the video clip with the police to help the authorities capture the intruder quicker. Nest Cam Outdoor IQ is tamperproof. 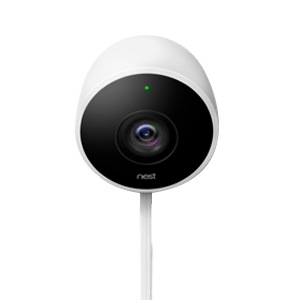 You’re assured that the footages captured by Nest Cam Outdoor IQ stay safe in the cloud as Nest encrypts data with TLS/SSL and AES 128-bit encryption. Two-step authentication is also in place to keep your data safe and private. This camera has a base that completely conceals the power cord. The power cord of this camera plugs into an indoor outlet. It’s, therefore, hidden, preventing intruders from tampering it. Nest Cam Outdoor IQ gives you a strong Wi-Fi connection. Nest Cam Outdoor IQ is equipped with 2×2 MIMO chip, making streaming experience faster. Nest Cam Outdoor IQ is weatherproof. Nest Cam Outdoor IQ received an IP66 rating. IP, which stands for Ingress Protection, refers to the level of sealing effectiveness of a device against intrusions such as dirt and moisture. IP66 means that the Nest Cam Outdoor IQ is protected against dust and powerful jets of water. With Nest Cam Outdoor IQ, you’re assured that this device will still function come heavy rain or storm. Nest Cam Outdoor IQ can be used day or night. Shadows or no light can’t deter Nest Cam Outdoor IQ from producing clear images. This camera is equipped with daytime HDR, combining multiple 4K images to even out challenging lighting conditions. So you’ll still see clear images even if they’re originally blown out or lost in the shadows. It’s also equipped with high-power infrared LEDs for clear, even night vision. Nest Cam Outdoor IQ functions well even in a noisy environment. With Nest Cam Outdoor IQ’s HD talk and listen built-in speaker and mic, you’re assured that you’ll still receive audio alerts even in noisy environments with the noise and echo suppression features. On its own, Nest Cam IQ outdoor may deter intruders from breaking into your home. This outdoor camera also works with other Nest security cameras, including the smart video doorbell Nest Hello and Nest Cam IQ indoor cameras. Security cameras have been proven as crime deterrents. Studies have shown, including that of theUrban Institutestudy, that security cameras have indeed helped prevent and solve crimes. Criminal elements don’t want to be seen on camera. The presence alone of a security camera scares would-be intruders away. These Nest video cameras will serve as a secure alarm system, protecting your home from intruders. If you’ve put in place Nest Cam IQ outdoor cameras outside your home, Nest Hello for your front door and Nest Cam IQ indoor cameras inside your home, you’ll be alerted of intruders trying to enter the front side, back side and everywhere in between of your home. Contact ustoday to learn more and protect your family! Particle pollution is one of the air pollutants that your home air filter should be able to remove. Particle pollution, also known as particulate matter (PM), is made up of tiny pieces of liquids, solids or a mixture of both that are in the air. Particles differ in sizes; some particles are big enough for you to see, while some are too small. The bigger particles are called PM10 – referring to particles 10 micrometers in width or more than 2.5 micrometers. Dust is an example of a bigger particle. The smaller particles, meanwhile, are called PM2.5 as they’re less than 2.5 micrometers in width. Examples of smaller particles are pollen, dust mites and soot (produced when materials are burned). According to the Centers for Disease Control and Prevention (CDC), breathing in bigger particles can irritate your nose, eyes and throat. The CDC said breathing in smaller particles are more dangerous as they can enter into the deep parts of your lungs or even into your blood. CDC said people who are most likely to experience health effects as a result of particle pollution include those with heart or lung diseases (for example, asthma), older adults, babies and children. Bioaerosol is a subcategory of particle pollution that refers to any airborne particles that are biological in origin. Bioaerosols vary in sizes. Based on their sizes, they can either be a bigger particle or a smaller particle. Animals, plants, soil and water are potential sources of bioaerosols. Given that these biological sources are present in nature, this means that bioaerosols are present in just about everywhere. Mold is an example of a bioaerosol. According to Health Canada(PDF), molds are of special interest in terms of human health as some molds contain inflammatory properties, others contain allergens, and some have toxic properties. Major causes of mold growth, according to Health Canada, are condensation of moisture on surfaces as a result of excessive humidity, lack of ventilation, water leakage (from a broken pipe), and water seepage from the outside (from a leaking roof, cracked basement or flood). Health Canada and the Institut national de santé publique du Québec published reviews of the scientific literature relating to the health effects of molds on human health. The organizations concluded that exposure to indoor mold increases the prevalence of asthma-related symptoms, including chronic wheezing, irritation symptoms and non-specific symptoms. Odors can be both pleasant and unpleasant. Some odors can be health hazards and some aren’t. Harmful odors can come from volatile organic compounds (VOCs), harmful chemical contaminants found in many home environments. Examples of harmful odors derived from VOCs are paints, wall coverings, cleaning agents, carpeting, vinyl flooring, fabric materials and furnishings, air fresheners, perfume and shampoos. “If these VOCs and other chemical contaminant sources are not controlled, indoor environmental quality problems can arise, even if the building’s ventilation system is properly designed and well maintained,” the CDC said. Formaldehyde is another example of a harmful odor. At room temperature, formaldehyde has a pungent, suffocating odor. Formaldehyde is used as a food preservative. It’s also used in household products, including antiseptics and cosmetics. The Lennox Healthy Climate HEPA air filter eliminates particle pollution, bioaerosols and harmful odors through its 3-step air filtration process. This air filter uses the same filtration technology used in hospital operating rooms and science labs. It functions like a vacuum; it pulls dirty air and then undergoes a 3-step cleaning process. The first stage of the Lennox Healthy Climate HEPA filtration process is called “Pre-Filter”. In this stage, bigger particles – those particles that are more than 2.5 micrometers in width – are removed from the air. The second stage of the air filtration process is called “HEPA”, which stands for high-efficiency particulate air. In this stage, smaller particles – those particles that are 0.3 micrometers in width and less than 2.5 micrometers – are removed from the air. At this stage, 99.97% of particulates, including bioaerosols, are removed from the air. The third stage of the Lennox Healthy Climate HEPA filtration process is called “Carbon”. The word “Carbon” refers to the 1/2-inch thick carbon filter used for removing odors and chemicals from the air. This air filter comes with an optional carbon canister that removes more odors and toxins like formaldehyde. After this last filtration stage, the clean air is then released from the air filter to be introduced into the air you and your family breathe. Keeping your home free from air pollutants is important as according to Health Canada, Canadians spend approximately 90% of their time indoors. Installing Lennox Healthy Climate HEPA air filter in your home ensures that 99.97% of particle and bioaerosol pollutants, as well as harmful odors, are removed several times a day. Health Canada recommends that your home air filter should be used along with good ventilation and reducing and eliminating sources of indoor air pollutants. Call ustoday to improve your air quality and protect your family.